This article takes issue with the dominant managerial view that teaching is improved by close supervision and imposed lesson observations. Instead, I argue for collaborative teaching approaches to re-establish the principle that teachers and lecturers are able and willing to reflect on their practice without contemporary punitive approaches. I will argue that collaborative planning, team teaching and reciprocal approaches to evaluation have a far more profound and empowering effect on teachers and are far more likely to spread good practice than the present dominant top-down approaches. The crisis in teacher recruitment and retention demands that schools, colleges, universities and politicians make some radical changes that allow for teacher creativity and agency to re-emerge. In order to establish the case for this proposition we have to consider the wider policy context that educational establishments are working within. The rise of neoliberal restructuring and forms of deregulation in educational institutions has established an artificially inspired market, a quasi-market, as King. The entry of private providers sharpens the process of deregulation and competition and promotes corporate performativity cultures. Large academy chains with highly paid executive heads and administrators operate on hierarchical structures outside the control of parents, the teacher trade unions and the local authority. Educational aims have become narrower focusing on economic competitiveness and students are encouraged to view qualifications simply as ‘a positional good’, allowing them to have a higher earning power in the jobs market. A new instrumentalism has emerged as the idea of education as enlightening and a public good diminishes. The language used in educational establishments over the last period has also changed dramatically. Many educational managers no longer talk about teaching but now often refer to teaching as ‘curriculum delivery’. Some teachers are subjected to powerpoints written by academy chain managers that they have to ‘deliver’ to their students. Instead of talking about reviewing and developing the curriculum the buzz word is ‘business diversification’. The notion of a ‘satisfactory’ lesson has been abolished by Ofsted and now lessons have to be good or ‘outstanding’. Inspections, management observations or learning walks can ‘fail’ a teacher who may then be subject to competency procedures. ‘Class blind’ approaches, that dismiss discussions of social class in education, dominate the discourse as no excuses are tolerated for the underachievement of students and this casts aside discussions on the nature of a cohort or of an institution. Martin Thrupp has produced interesting research in this area of a ‘class blind’ discourse emerging in schools. He has highlighted how ironic it is that as schools have become more selective an overoptimistic view of school improvement against the odds often means that school improvers fail to question greater selection of school intakes by educational quasi-markets. So the social context of schooling is left undiscussed and the effects of rising inequality and child poverty remain unaddressed. Intolerance to real debate and discussion often permeates training sessions in many schools as those teachers who challenge aspects of the performativity culture are dismissed or silenced. Often these are the more experienced teachers whom Ivor Goodson calls ‘the elders’ and who may suggest different approaches. These teachers either remain as disaffected members of staff or are encouraged to leave an establishment. The datafication of educational establishments contributes to this corporate ideology through ‘teaching by numbers’. 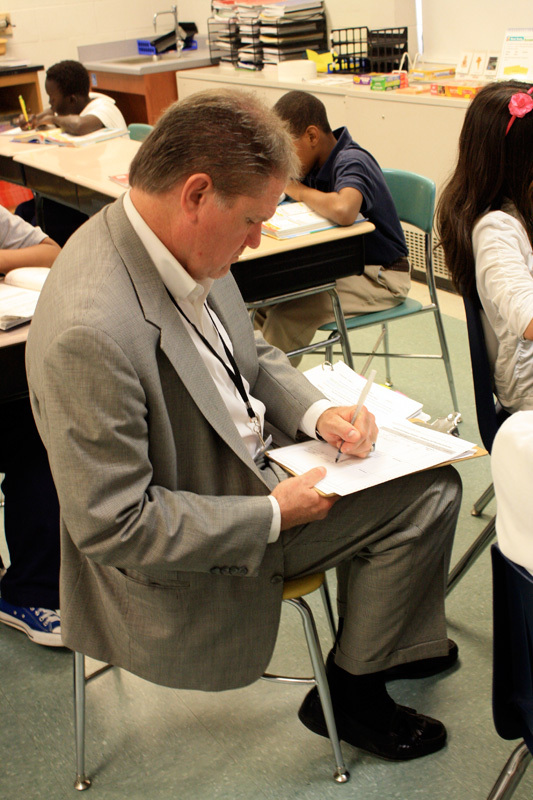 Students are assessed each term and teachers are graded on their performance in lesson observations and exam results. This ‘data rich’ environment can allow those without educational expertise to drive through changes that focus on addressing the data rather than more holistic educational aims. Formulaic solutions emerge and this can often restrict teacher autonomy and suppress experimentation and creative pedagogies. As department meetings become highjacked by the ‘teaching by numbers’ agenda, there are often fewer opportunities where staff can work together to plan, review and develop the curriculum generating creative approaches to teaching. Anthony Giddens describes this as a state of ‘anomie’, a loss of identity as previously child-centred moral codes are challenged. This article is suggesting that the tyranny of the bite sized measurement of learning and of the performativity cultures must be challenged if we wish to avoid the new instrumentalism which threatens to transform schools and colleges into ‘at best test and evaluation factories’ where teachers and pupils are denied access to critical thought. Universities, colleges and schools should be intellectual spaces where critical thought is encouraged. Education should be an empowering experience where students are nurtured and encouraged to learn more about themselves as they learn more about their subjects and the world around them. This kind of education requires a community of scholars that shares and builds on good practice to facilitate this kind of teaching. It requires routes to reciprocal self-evaluation that assist teacher agency and creativity rather than undermine it. For example collaborative planning and review; reciprocal peer observations where teachers act as critical friends; Video Assisted Teacher Evaluations’ (VATE) where teachers explore recorded lessons together; a focus on critical incidents in a lesson. Whilst many individual teachers will try to resist formulaic teaching approaches, performativity cultures block communities of practice and systematically stifle creative pedagogies. It is time for them to go. This entry was posted in Accountability, Teachers and tagged accountability pressures, competition, lesson observation, professionalism. Bookmark the permalink.